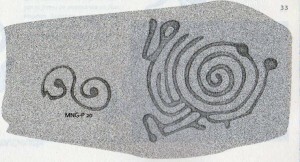 The inspiration to develop the logo for the VIII International Meeting of the WATERLAT-GOBACIT Network was taken from petroglyphs found at the Guayabo National Monument, Costa Rica. The Guayabo National Monument is located in the Turrialba canton, province of Cartago, and it is one of the most important archaelogical sites in Costa Rica. It is considered to be up to 3000 thousand years old, and would have been a centre with economic, religious and political functions. Its aqueduct is still in working order, and in 2009 it was awarded the status of Heritage of Humanity by the American Society of Civil Engineers in recognition to the complexity of its engineering design. Check here for more information in Spanish or English. In the book by Ana Cecilia Arias, Floria Castrillo and Grace Herrera published in 2012 and titled A history written in stone. Petroglypths in Turrialba’s Guayabob (in Spanish), the authors present the results of a Community University Work (TCU made by members of the University of Costa Rica between 1978 and 2002. The work was based on previous research by Floria Castrillo who had reproduced the petroglypths found in Guayabo. In the book, they explain that the publication is not just to recover the memories carved in stone but to present “a collection of drawings of exquisite quality and with an incomensurable symbolic value” (text from the book’s back cover). According to the book’s authors, the spiral is a symbol of water making reference to tornadoes, hurricanes, but also to human migrations in search of water (maps). The image taken for the logo corresponds to a petroglypth foun din Turrialba’s Guayabo (Arias, Castrillo, and Herrera, 2012, p. 33). The authors believe that in some cases the petroglypths refer to the random forms carved by water, for example in river deltas, and in other cases represent human-made patterns such as agricultural landscapes. The book not only focuses on the process of recovering Guayabo but also makes reference to the interpretations made by other researchers in comparative studies with petroglypths from other cultures. For example, designs from graves found in Ireland, or petroglypths from Arizona in the United States and from the Sonora Valley in Mexico. This has led the authors to develop new avenues for future research: the representations found in the area trascend Guayabo and become a representation of a language that has been used to record individual and colective lives of humans and other living beings, written en stone. Áreas Protegidas y Parques Nacionales de Costa Rica Áreas Protegidas y Parques Nacionales de Costa Rica, Monumento Nacional Guayabo. – Áreas Protegidas, 30 de 06 de 2013. – 26 de 07 de 2016. Available at: http://areasyparques.com/areasprotegidas/monumento-nacional-guayabo/. Arias Quirós Ana C, Floria Castrillo Brenes, and Grace Herrera Amighetti, Una historia escrita en piedra. Petrograbados de Guayabo de Turrialba, San José : Vicerrectoría de Acción Social. Universidad de Costa Rica, 2012.